Just Rite Marine Construction Inc.
Our docks and piers are constructed and built with the finest lumber available and with greatest accuracy. If you can dream what kind of dock pier you want, Just Rite Marine Inc can build it exactly to how you want it. When used for water erosion, rip rap absorbs and deflects the impact of water before it reaches the important stuff (i.e. bridge, home or a road). Simply put, when water energy is strong, the rip rap takes a hit for the team, leaving our bridges, roadways and shorelines to serve another day. Rip Rap is the best protection against tropical storms or hurricanes. Rip rap also helps to create habitat for wildlife. When used along waterways, rip rap helps to support small marine animals; while dry land rip rap provides shelter to a variety of land loving plants and animals. Vinyl sheet piling material is easy to install and creates a visually appealing, long-lasting bulkhead result. Available in custom lengths with several different widths, thickness and profiles available. Just Rite Marine Inc works hard to meet your projects requirements. No job is too big or too small. With long reach capabilities, multible barges, and many other assists, we are able to dredge some of the biggest marinas, canals, basins, and most other waterways. Our dredging is done with the upmost care and will meet or exceeds all evirnmental standards. Dredging is important and needed in many areas of Ocean City, MD. No piling is too big for us. With our long reach capabilities, we can drive various types configurations of boat lift poles. Welcome to real quality marine construction. 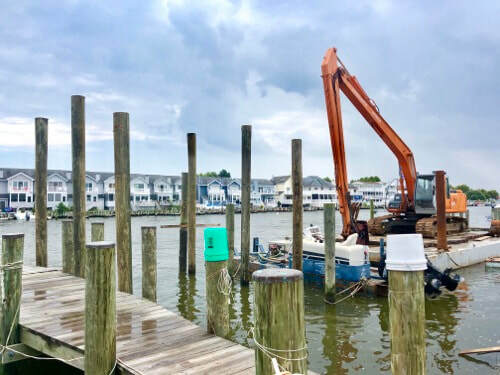 Just Rite Marine Inc is a local marine construction business that is experienced in the field for over 25 years providing services to customers all over the Eastern Shore, Ocean City, Ocean Pines, and all other Delmarva areas. Just Rite Marine Inc is a licensed marine construction company and licensed MHIC. Just Rite Marine Inc offers free estimates for any marine construction job that you are interested in. Just Rite Marine Inc is very personal and knowledgeable in the marine construction world and will help you get through the process in getting the right bulkhead, rip rap, or dock that you want. Thanks for visiting.